While Eminem and Christina Aguilera fight it out for the number one spot on the BILLBOARD charts and the hearts and dollars of the MTV generation, there is an unlikely force on the music scene who is giving them a run for their money. Josh Groban may not win an award at the next MTV Video Music Awards show or be heard on many radio stations, but he is steadily rising in popularity as more and more people discover his brand of classical pop. Despite limited radio play and a modest presence on the pop-music circuit, Groban’s self-titled debut album has gone double platinum in the United States and sold almost four million copies worldwide. Not to mention the fact that the CD has remained on The BILLBOARD 200™ for almost as long as it has been available, soaring as high as number 8. The 21-year-old singer has all the makings of an American idol: a strong baritone belt, a face that could easily appear on the cover of PEOPLE, and extremely devoted fans. But Groban doesn’t sing catchy pop tunes, he sings romantic ballads in English, Italian, and Spanish, and his rise to prominence is the stuff that dreams are made of. Four years ago, when Groban was a youthful 17, multi-Grammy-winning producer David Foster found himself in need of a singer to fill in for Michael Crawford at an inauguration party for the newly elected governor of California, Gray Davis. Foster called Groban’s voice teacher at the time, Seth Riggs, and asked for some tapes. Groban’s was among those that Foster received. Foster recognized something special in Groban’s submission and called on him to sing at the governor’s gala. Groban’s performance marked the beginning of a fantastic series of events that have catapulted him into the eyes, ears, and living rooms of millions. As Foster explains in JOSH GROBAN IN CONCERT, “It only happens a few times in a lifetime that a tape sticks out so dramatically. … I heard all these other tapes and they were all good, but when your voice came on it was just breathtaking. … There is such a place in this world for your voice.” And together, they have been finding that place. With Foster’s guidance, Groban performed at industry-related charity events, which is where he was seen by the creator and executive producer of ALLY MCBEAL, David E. Kelley. Kelley was so impressed by Groban’s performance that he created the role of Malcolm Wyatt for him on the 2001 season finale of the series. Groban’s appearance as Malcolm, an awkward high school student with angelic pipes who sues a girl who breaks her promise to accompany him to the prom, and winds up stunning the high school with a song, elicited thousands of e-mail messages from fans eager to find out more about this new singer. 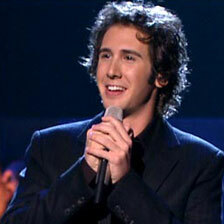 Groban’s career was launched. Having already secured a record deal with 143 Records, a joint venture between David Foster and Warner Bros., he went on to reprise his role on another episode of ALLY MCBEAL, perform at other industry events and on television, and sing with Charlotte Church at the closing ceremonies of the 2002 Olympic Winter Games. The rest is history, or at least the making of it. Since then he has continued his swift but steady rise to the top of the music industry. His debut album has seen great success; he has had a major profile on 20/20, which will be rebroadcast on December 20, 2002; and he has appeared on THE OPRAH WINFREY SHOW, GOOD MORNING AMERICA, THE TODAY SHOW, and THE TONIGHT SHOW. Now he headlines his own concert special on PBS. JOSH GROBAN IN CONCERT introduces the singer to those yet unaware of his talent and fuels the ardor of the many who have followed his work. The concert, recorded live on stage at the Pasadena Civic Center, features Groban with an array of special guests, including Andrea Corr, the lead singer of The Corrs, violinist Lili Haydn, composer John Williams, and singer Angie Stone. Conceived by Groban and Danny Ezralow, and directed by GREAT PERFORMANCES series producer David Horn, the concert successfully showcases Groban’s vocal variety and powerful presence, while highlighting his boy-next-door appeal. With this fortunate combination, Groban immediately draws listeners in and takes them on an emotional journey. Equally able to communicate the work of film composing legend Ennio Morricone and that of adult contemporary icon Richard Marx to his captivated audience, Groban, as a singer and a performer, is winning fans across a very wide spectrum.